Repeatedly we have churches describe to us the significant amount of exasperation they went through during their church chair buying experience. They will communicate to us “We never would have believed it would be so frustrating!” In fact, that has become a familiar refrain our team has heard far too often. The reality though is that the purchase of new worship chairs for your church in no way needs to be such a stressful journey. Let’s take a look at five easy pointers that can remove the stress and result in a prudent purchase. Start your church chair purchasing journey early! The easiest way to remove the pressure and stress of a church chair purchase is to get started early on the task. I like to suggest a six month lead time to churches. While some manufacturers and importers carry some chairs in stock already produced, the reality is that those chairs are produced in very limited fabric selections and frame finishes. In addition, the inventory levels can fluctuate greatly during different parts of the year. Did you know that from the time a church chair manufacturer receives a production order for church chairs, to the time those chairs are ready for delivery, averages about twelve to fourteen weeks? We like to recommend to churches that they allocate about three months for the process of determining their church chairs and then plan on three months for the production of those same church chairs. Six months seems to be a timespan that consistently proves out well. Use Church Chair Finder to get the lowest prices at the outset! It is no surprise that churches will look first to the Internet when beginning a worship chair purchase. It is not as if there is a church chair store down by Starbucks! And once they begin searching the Internet, they will certainly discover there is a seemingly endless number of church chair manufacturers and importers and distributors. They will each ask your church to contact them for more information and if you do so, your church will immediately become the latest target for a great number of salespeople. We recommend beginning with the free services of Church Chair Finder! You can fill out a confidential form and begin receiving information and church chair quotes, but because your personal information is protected for your project, you have a chance to evaluate first and contact personally later! Make sure to acquire samples of the church chairs you decide to consider! It is critical that your church not make any church chair purchase until you obtain an exact sample of the chair you are considering. We like to share with churches that just as each committee member would never dream of purchasing a new automobile without kicking the tires, you should never consider purchasing new church chairs without having the same opportunity with them! We have found that those church chair manufacturers and distributors who possess a church chair of quality will more often than naught make it easy for your church to acquire a sample chair. And we have also found the opposite to be the case, that those church chair importers and manufacturers selling inferior chairs will likely not make it easy for your church to acquire one of their chairs as a sample. That should indicate something to your church! Insist on church chair references and contact them! Church chair manufacturers and dealers will keep a record of all their church chair sales. Ask your salesperson for the names of a few of those customers in your geographical proximity as you would like to check with a few past customers. If the salesperson is reluctant to provide those contacts to you, that likely is an additional indicator that you are not working with a quality church chair supplier. If they do provide you those requested contacts, make sure to call and connect with each and also make some onsite visits if geography allows. Observe how long each church has had their chairs and what sort of condition they are in presently. Pull the trigger on your church chair purchase and look forward to receiving your chairs! When your church chair order is placed, the biggest part of your task is now over. And if you have adhered to the steps listed above, you can anticipate the arrival of your new church chairs with the full confidence of a job well done. When the truck with your new church chairs does reach your church, be sure and count your chairs accurately to make sure all did in fact arrive. Also, if you observe any obvious or suspected damage to your chairs, perhaps occurring during the shipping process, it is always important to note that well on your bill of lading before signing for your new church chairs. But overall at this point, the most important thing is that your church now enjoy their new church chairs! Search for “Church Chairs” on the Internet and your results will be staggering! So much so that we regularly hear from churches frustrated at the entire church chair shopping process. Trying to sort through all the exaggerated claims, and sales ploys, and marketing efforts directed at churches is time-consuming, confusing, and exasperating. One blog entitled “My Church Chair Nightmare” accurately captures the experience of far too many churches. So how does a church go about obtaining an excellent price on a quality church chair? One recommended solution is to utilize the ministry of Church Chair Finder. This easy to use website allows your church to enter some basic information ONE TIME regarding your church chair needs. Church Chair Manufacturers, Distributors and Dealers then begin the process of competing for your business! You may remember the slogan for the popular Lending Tree Commercials “When Banks Compete, You Win!” Well, when church chair suppliers compete, your church wins! Here is what some churches have discovered! They have contacted a church chair supplier directly, have worked with a sales representative, and then have received a quote for church chairs. Later they have utilized Church Chair Finder and have subsequently received quotes from church chair suppliers who have chosen to participate in the Church Chair Finder ministry. In some cases they have received a second quote from the same church chair supplier they had previously received a quote from, only the price was now lower because of the reality of competition by the church chair supplier! Church Chair Finder can assist your church in being in the driver’s seat during your church chair project and remove much of the frustration so often associated with the entire process. And when you receive church chair quotes that in some cases are “apples to apples” on the same church chairs, you will be able to see for yourself the difference in price charged on identical church chairs. An additional benefit is that church chair suppliers that participate in this ministry tend to demonstrate a healthy confidence in their line of church chairs. There is an element of risk when entering into this level of competition for your church’s business! It is certainly reasonable that those willing to take such a risk are those church chair suppliers who have a quality church chair to offer your church, versus one of the very low-quality church chairs that are quite prevalent today. 1. How Comfortable Is the Chair? Your church chairs will be used more than anything else in your church. The reality is that people like to sit when they come to church. Making sure to purchase chairs that will be comfortable for 60 to 90 minutes is therefore critical. We always urge churches to acquire samples of all the church chairs they are considering. Then don’t just sit on them for 30 seconds and draw what likely will be a flawed conclusion as to which chair is the most comfortable. Take the chair to your desk and use it for a couple of hours to better determine if the chair will be comfortable for a normal church service length. Do this with each chair you are considering. Have other people in your church do the same. By doing so you will have a far better sense of whether the chair you are considering is truly comfortable. 2. Is the Chair from a True Manufacturer or a Third-Party Importer? We live in a day when it can be hard to tell if the chairs you are considering are produced by a domestic manufacturer who has manufacturing locations perhaps both stateside and offshore and then are provided through a dealer network for that manufacturer, or if the chairs are produced by a foreign factory and then “branded” by an American dealer as “their” chairs. Please know this latter scenario happens quite often in our day and you will often see phrases like “built to our specifications” that can indicate this sort of arrangement. Our counsel is to make sure there is a legitimate domestic-based manufacturer who owns the tooling, the molds, creates the quality control process, and makes the same chairs for many years, versus an importer who regularly purchases from different foreign factories and chair models change as often as the choice of factories. Under the former you can purchase more of your chairs perhaps ten years later, while under the latter you will almost certainly not be able to do so. 3. Does the Warranty Have a Lot of Fine Print Within It? Be sure to always ask for an actual printed warranty certificate for the church chairs you are considering purchasing. Then once you have it in hand (if you are not able to obtain one strike that dealer off your list of potentials) read and study it closely. Is there “fine print” that really makes the warranty almost meaningless? For example, we know of one imported line of chairs that requires the church to send the chairs back to the shipping location at the church’s expense so they can examine the chairs to see if there is a valid warranty claim. The church has to pay large dollars to package and ship and they also have to go without chairs for an extended time period. Obviously almost no churches are able to meet this requirement. As a result, the warranty is essentially meaningless as the requirements are tedious and unreasonable. Don’t let this disappointment happen for your church. Ask for some verified examples of how the warranty was honored in a way churches were pleased with. 4. Are We Placing Too Much Emphasis on the Price of the Chairs as a Church? 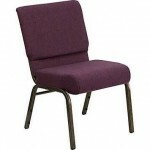 Churches have limited budgets and the price-point of the church chairs you are considering is certainly important. However, please understand this is a major investment in an item your church will use 52 Sundays a year for the next 20 years. That means you will use these chairs over 1,000 Sundays. If you spend an extra $10.00 to obtain a quality church chair that means that will cost your church ONE PENNY a Sunday per chair. Our firm belief is that if a church body understands that for a few dollars more, they can have a chair that is far more comfortable, have far greater quality, have an honored warranty, and have chairs that still look good after many years, there are few who would not be willing to help make up that small additional investment. Share this reality with your people and we believe you will find that to be the case. 5. Does Your Environment Demand Any Special Considerations for Your Church Chairs? Not all church chairs will work equally well in all environments. For example, if you need to take up and store your church chairs often, then there are features available that will make that easier and there are some features to avoid. If your church needs to efficiently store your church chairs, then there are some chairs that will store more efficiently than others. If the geographical area your church is located in requires special fire ratings for the foam and fabric on your chairs, then that will limit the chairs choices available to you. We believe working with a church chair dealer that provides a wide range of products will increase the chances that the chair you purchase works best for your church, versus working with a dealer that will be motivated to encourage your church to purchase the chairs they offer regardless whether they are the best fit for your church. Knowing the answers to these five questions before your church purchases new church chairs will make a great positive difference for your church over the years ahead.